Will Traynor (Sam Claflin) led a very active life. An accident left Will a quadriplegic. Depressed and angry with his new life, he has lost the will to live. His parents, Stephen (Charles Dance) and Camilla (Janet McTeer) have hired several people to assist him and provide companionship to Will, hoping to cheer him up. Due to Will’s attitude towards life, none of them last very long. When Lou Clark (Emilia Clarke) is let go from her job in a tea shop, she applies to work with Will. Will’s caretaker, Nathan (Stephen Peacocke), who does most of the heavy lifting and dirty work, tries to help Lou make a connection with Will. Lou’s wild wardrobe and perky outlook on life wear on Will. As Lou and Will work together, a bond begins to form between them. However, everything is turned upside down when Lou accidentally overhears some startling news. 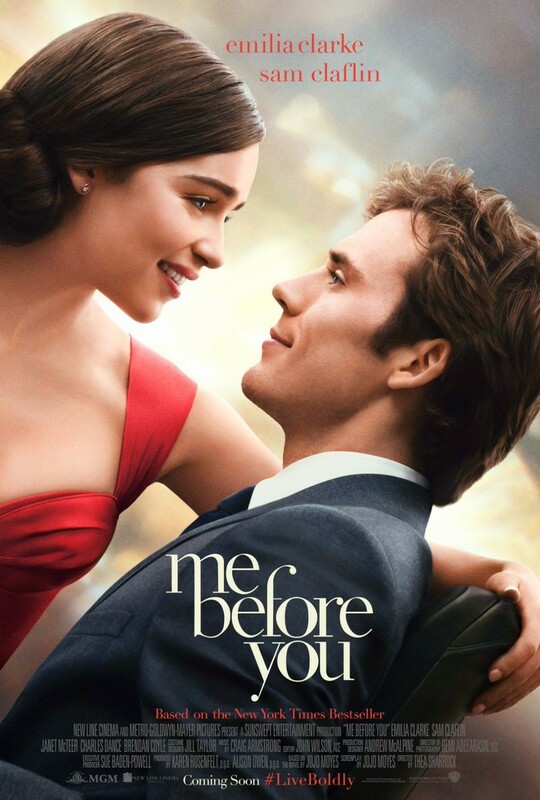 While there have been many movies centered around a person with a disability who is “saved” by a non-disabled person, Me Before You takes a slightly different angle on the story. It isn’t so much about one person being rescued as it is solely about the developing relationship between the characters. Many of us are used to seeing Emilia Clarke play a slightly more aggressive role on Game of Thrones. While she is amazing as Danaerys, her character in this movie is the complete opposite. Starting with her look, with her naturally dark hair, to her eccentric wardrobe, down to her bubbling, charming personality. Clarke plays this role as convincingly as she does her GoT character. Likewise, Sam Claflin, known for his part in The Hunger Games franchise, shows a very different side. Will is completely broken, both physically and mentally, and has given up on everything. There is great chemistry between Clarke and Claflin that grows as their relationship develops. As I mentioned, the underlying story has been told before. While it may be a bit predictable at points, but they’re not trying to throw any surprise twists at you. It’s just the natural progression of where the story is heading. There are a few times when the story seems a bit hurried, but those moments are few and far between and can be easily forgiven. The faults in the movie are outweighed by the story and how well it is told. Adding in truly likeable characters makes it an enjoyable, if sad, romantic story. Me Before You is a romantic movie with one purpose, and one purpose alone: to make you cry. If you don’t, then you must have a stone heart. Make sure you bring tissues.